A fourth-edition copy (1885) of John Henry Newman’s Lectures on the Doctrine of Justification, is perhaps the most precious article now in my possession (though not in my ownership). On the leaf opposite the appropriately-yellowed title page, in the upper left-hand corner, there can be found the elegant signature of one Walter Pater, fellow of Brasenose College, Oxford, tutor to Oscar Wilde, and sometime owner of the volume. In the bottom left can be found a dedication, in pencil, by my freshman-year literature professor, who first taught me Wordsworth and Goethe and Pushkin. 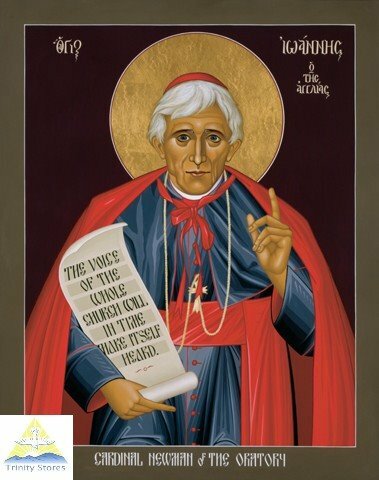 Since first learning of John Henry Cardinal Newman’s life and example, way back when freshman year, I have had a great reverence for the man, including physical reverence. There is a stained-glass window of Newman at his desk in Littlemore, in the rear of Georgetown’s college chapel; I made a habit of kissing it as I entered and exited, as I might an icon. I remember one morning very distinctly when I went to visit him in his window: I was in the midst of an emotionally immature, but utterly sincere, attachment to another boy; and learning that Newman’s last will and testament had been to be buried in the same grave with the “friend of his heart,” Fr. Ambrose St.-John, some sense of compulsion drove me to go say thank-you. So it is with gladness that I hear tell of the papal beatification in Birmingham today. I would like to make two observations, one about the cast of Newman’s mind, and one about his sexuality. Newman, like myself in some way, was personally a scholastic, in the broadest sense—a schoolman, a man of reason, governed in his thinking and writing by scholarly criteria of evidence and proof and probability. But what is interesting to me, both from an Eastern Orthodox and from an ordinary psychological point of view, is that Newman exercised his refined personal scholasticism on, and in creative tension with, commitments of a very different order. He was not, after all, especially moved by scholastic theology, that is, the elaboration of theological propositions (all be they divinely revealed) using academic-philosophical means. Rather he cared primarily for patristic theology—theology as it had been practiced before the rise of the modern (medieval) university, when one’s right to speak of divine things was still supposed to be earned in the sweat of much (monastic) ascesis, and when philosophy was still supposed to embrace a whole way of life. Augustine, so to speak, and not Aquinas, converted Newman. This fact should make him, and the patristically-minded pope now beatifying him, central figures in contemporary Catholic-Orthodox ecumenism. There is much in Newman for the Orthodox to appreciate. I will cite one example of what I mean. In his Grammar of Assent, Newman dilates on what he terms the “illative sense,” which he closely identifies with phronesis, the “prudence” or “practical wisdom” of ancient Greek philosophy. The illative sense, for Newman, is something more than abstract ratiocination. Not for nothing did he choose a quotation from S. Ambrose of Milan for the book’s dedication: Non in dialectica complacuit Deo salvum facere populum suum; “It did not please God to save his people through logic.” Rather, the illative sense is above all concerned with judgment “in concrete matters,” —it is a sense for real life, for vitality (the same sense so near and dear to Russian religious thought), and hence its articulation inevitably entails some awareness of our subjectivity. Translating and transforming pagan Greek philosophical terms into Christian theological ones, we might indeed draw an analogy between classical phronesis, Newman’s illative sense, and “the eye of the heart” of the Eastern fathers—the latter being that perceptive faculty which belongs to our most essential nature as persons, created in the image and likeness of God. Newman, Bulgakov, Nyssa. All three insist that we do have something to contribute, freely and concretely, that is, properly personally, to our own religious life. Much is currently being made of Newman’s probable homosexual orientation. Peter Tatchell, deserving of all praise for submitting to the blows of neo-Nazis at Moscow’s Pride, has nevertheless been making himself generally obnoxious; the Hungarian-born atheist Frank Furedi “gets” Newman much better. A traditionalist Anglo-Catholic blog out of Oxford makes the entirely legitimate point, that we cannot know for sure what Newman’s orientation was; but both by its exaggerated rhetoric, and by its seeming uncomfortableness with the very idea that a saint might have been “that way,” the blog undermines its own moral credibility. One comment about this. It is a pious tradition, and a venerable one, for Christians to adopt patrons on the narrowest of pretexts. The Bible does not say that Mary Magdalene, for example, was a prostitute—and yet she is patron saint to prostitutes. Nicholas of Myra was not a sailor—and there he is, patron saint to sailors (in addition to children). Some saints may never have existed historically at all—George, for example, patron to soldiers, or Christopher, patron to travelers (Christopher being spectacularly represented in Eastern iconography, with the head of a dog). Christians have always kept such pious traditions. I like to think that queer Christians, who object in conscience to their Church’s teaching, will take Newman, a great apologist for the authority of conscience, and one (in? )famously described in his day as having possessed “a woman’s soul in a man’s body,” as one of their heavenly patrons. A Russian might call him porjadočnij—fair and decent, with a strong connotation of meek and gentle. Blessed cardinal-deacon, pray to God for us. John Henry Newman, An Essay in Aid of a Grammar of Assent (London: Burns, Oates & Co., 1870), p. 346. Sergius Bulgakov, The Bride of the Lamb, trans. Boris Jakim (Edinburgh: T & T Clark, 2002), p. 135. Gregory of Nyssa: The Life of Moses, trans. Abraham J. Malherbe and Everett Ferguson (New York: Paulist Press, 1978), p. 134. Wonderful, wonderful post on one of my favorite Christian figures. Very insightful as usual! Really a great post. Thanks so much, I’m loving the blog. Just to let you know your web page looks a little bit different on Firefox on my netbook using Linux . This site has got a lot of really useful information on it. Thank you for sharing it with me! Have you given any kind of consideration at all with converting your site into German? I know a couple of of translaters right here that will might help you do it for no cost if you want to contact me personally. When I at first commented I clicked the Notify me any time new comments are added checkbox and currently each time a remark is added I get four email messages with the exact same comment. Jesus Christ there is lots of spammy feedback on this page. Have you ever before believed about attempting to eliminate them or putting in a wordpress plugin? How come you do not have your website viewable in mobile format? Can not view anything in my Droid. Is it alright to put a portion of this on my website if I submit a reference to this webpage? Could you message me with any hints & tips about how you made your blog look this awesome, Id appreciate it. It appears to me that this site doesnt download in a Motorola Droid. Are other folks getting the same issue? I enjoy this web site and dont want to have to skip it when Im gone from my computer. A interesting blog post right there mate ! Thank you for that ! This is really a amazing website, would you be interested in doing an interview concerning just how you produced it? If so e-mail me personally! Do youve got a spam problem on this site; I also am a blogger, and I was wondering your situation; we now have made some nice methods and were searching to swap solutions with other folks, be sure to blast me an e-mail if planning to pursue. Just to let you know your web site looks a little bit strange in Firefox on my notebook with Linux . Wanted to drop a remark and let you know your Rss feed isnt working today. I tried including it to my Bing reader account but got nothing. While I truly like this post, I think there was an spelling error close towards the end of the third paragraph. Could you email me with a few tips on how you made your blog look this good , Id be appreciative. This blog has got a lot of very helpful information on it. Cheers for helping me! Please email me with a few tips about how you made this site look this good , I would be thankful! I have got one idea for your web site. It seems like there are a couple of cascading stylesheet troubles while opening a number of webpages within google chrome as well as firefox. It is working alright in internet explorer. Probably you can double check that. Is it okay to insert a portion of this on my site if I post a reference to this website? Im having a teeny issue. I cant get my reader to pickup your rss feed, Im using msn reader by the way. Do you have a spam concern on this web site; I also am a blogger, and I was questioning your situation; we have produced some nice techniques and were looking to exchange solutions with other individuals, be positive to shoot me an e-mail if planning to pursue. How did you make a blog site look this good!? Email me if you want and share your wisdom. Id appreciate it! When I initially left a comment I clicked the Notify me any time new comments are added checkbox and now each time a comment is added I get 4 emails with the same comment. Nice post . Cheers for, visiting my blog dude! Ill message you soon. I didnt know that! How do you make this site look this sick!? Email me if you can and share your wisdom. . I love the website layout ! How was it made!? Its really good. This is a fantastic website, would you be interested in doing an interview concerning just how you produced it? If so e-mail myself! Cool post ! Cheers for, writing on my blog dude. Ill email you some time. I didnt realise that. I feel one of your current advertisements triggered my web browser to resize, you might well need to set up that on your blacklist. How did you make a blog site look this good!? Email me if you get the chance and share your wisdom. Id appreciate it! Even though I actually like this publish, I think there was an punctuational error near towards the finish from the 3rd section. Could you email me with a few pointers about how you made your blog site look this cool , Id appreciate it! Dude. This website is amazing! How do you make it look this good !? I Will have to come back again whenever my course load lets up – nonetheless I am getting your Rss feed so i can go through your blog offline. Cheers. Although I truly like this post, I think there was an spelling error shut to the end of the 3rd sentence.